We are all stories in the end. But those unending stories our children paint in their own words, fill up the blanks of our life to be some of the finest chapters. Isn't it? It was last week, a cloudy evening 7pm. I walked in my backyard with my cranky little son, a toddler. And he had so much to express how the moon had finished dinner too early and slept off (hidden) inside the clouds. How it will pee and we all will get rains! I was astonished and added fuel to fire encouraging him to continue. He then told me the sun and the moon do fight a lot too to reach "his house"! Wildest imagination eh? Some opportunities hit your door right on time. This time it was BlogAdda which introduced me to the complete activity set to foster creativity in such kids. 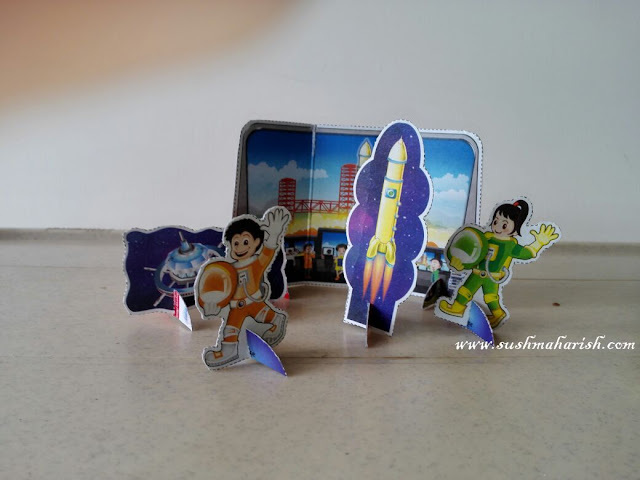 The "Magical Space Adventure" special pack for kids by Colgate-Palmolive. It was easy to grab one set for myself. Thanks to super fast BloagAdda. This pack first reached my little nephew. Little "V" let's call him. Just 3 and he's that same fellow who persuaded me, how the little water heater fitted on top of his bathroom wall WAS the "Humpty Dumpty" and apparently I started visualizing it like one too! I was now keen to know what stories waited for me when V lay his hands on these space characters. Hoping none of them resembled me at least! The box opening ritual, with non stop chatters and valiant efforts seemed to fill his day with lot of energy. All I can say is that I simply relished watching those moments in videos as he opened the box, piled up all the characters. Eagerness overloaded, with his best possible gestures, coded fumblers and few giggles in between, we managed to get to what V kept saying. Oh! What a marvelous time, there was a full cinema in V's stuttering words though. "Those characters really act too smart you know. Do you see the one wearing hoola hoop like didi, is he jelly fish? May be...how will he ever sit in the rocket and go up? 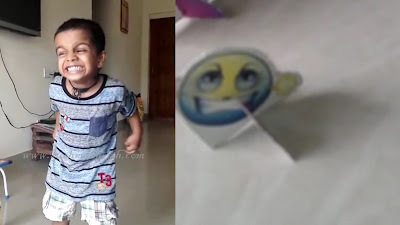 And that fellow (Saturn for us) with dabba (box in kannada) is fastest, because he has the dabba with him. zooooo...Night...yeah they all come in night and go in the rocket in the morning. Only the sun is wearing the pappa's sunglasses and he will come in morning. See angie (V named a character!) , he sat on the blue helicopter and went off to see the rocket". Non stop tales by V filled the entire weekend with unique fun and enthusiasm. Now that, V is so fond of a TV cartoon character called Shiva, he thinks these space characters borrowed Shiva's helmet. And what exactly do you think they are trying to do? Wait to understand what the 3 year old had to tell. They all sat in the merry go round (the space ship becomes a merry-go-round) and say 123 pico and fly into the sky. Upon asking what the pico thing was about, pat came the answer- "it comes in TV don't you know it"?. Well, my bad. Missed it, but had to google, scratch my head and find this video( the one below) on YouTube to finally understand him and hack his fumbled code. 1 2 3 take off! So much fun. Pico indeed. See, this is where the children are innocent and intelligent. He connected to the TV commercial he saw, soon after opening the pack of this space characters. Do you know there is no food box in the sky. So when debie (another space character named by V) is hungry he behaves just like this". These little toddler tales can fill all corners of your mind with so much laughter and freshness. We adults try reading stories from books for our children. But have we ever wondered how much they have to say? How much they have to express on their own? Imagination is the door to possibilities. It is where creativity, ingenuity, and thinking outside the box begin and foster creative problem solving in children. Love them, pamper them and talk loads to them. Who knows, one day few of them would be traveling in the space too. I read and loved it! Loved this "We adults try reading stories from books for our children. But have we ever wondered how much they have to say? " Thanks. Glad you liked the idea. Good one nd I m eagerly waiting to hear such stories too!!! No words to say. Innocent minds refreshing our hearts. Heard a lot about your writing from your sister. Hope to read more of your article. Indeed, kids activities are treasures. Thank You for kind words. How About Some Reality This Holi?